Although many fans of Darjeeling tea attribute its unique flavour to voodoo farming, a new book says the farming methodology goes beyond taste and aims at striking an ecological harmony. 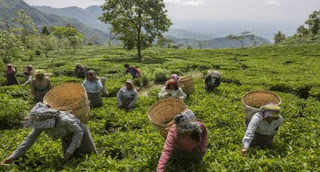 American travel writer Jeff Koehler who has come out with his new book "Darjeeling: A History of the World's Greatest Tea" says it is really hard to gauge how voodoo or biodynamic farming actually affects the muscatel flavour of one of the world's most prized tea. "Taste might almost be secondary. Biodynamics is a holistic approach to farming that seeks more than just flavor. It is a way of creating an ecological harmony on the garden, a tight web that interlinks the soil, plants, animals, and those who live on the estates," Koehler said. However he said there is no question that those who farm biodynamically treat their bushes with particular care and that is often reflected in the taste of the teas. The author wonders whether biodynamic farming actually makes the taste better, as many believe it to be the secret behind the unmatchable taste. "Does planting according to the moon's orbit and the position of the constellations make a difference in that final judgement of a tea when it's sipped from the cup? Does spraying the leaves with ground silica crystals that have been buried in cow horns give deeper muscatel flavours? A more nuanced body?," he writes in the book published by Bloomsbury.